Whether or not it is accurate, every map presents a point of view. Mapmakers choose to include some elements and exclude others, based on their audience and their purpose in making the map. In the 1600s, mapmakers made maps for many reasons: to share information, to attract new settlers, to promote new investment in colonial ventures, and to make claims of dominion by re-naming places and drawing political boundaries. 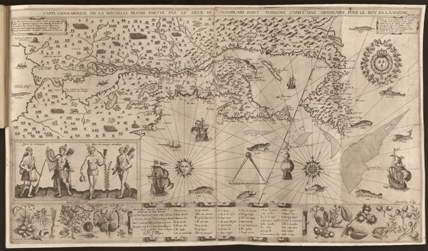 What elements of Samuel de Champlain's map of New France were designed to attract settlers and investors? 1. Friendly, European-looking Native people dressed in lightweight clothing suggest a hospitable environment. 2. Land and sea teem with animals valued for food and fur. 3. Navigable waterways promise routes for profitable trade.